Have you seen or heard of a food but are hesitant to try it? Quinoa. Kale. Chia seeds. Spaghetti squash. Greek yogurt. I can think of several foods that have been “trending” in the states over the past few years that many consumers are not sure what to do with or are cautious to try. When it comes to food, we are lucky to have an abundance of options available to us in the states. Sometimes, we have SO many options, it can be overwhelming or easiest to stick with what we know and like. There’s nothing wrong with that but I’m all about adventure when it comes to eating and encourage clients (and myself!) to try new things! You never know what you may discover. I hated tomatoes growing up and now I eat them like candy. Taste buds can change! Delicata squash is one of those foods that I have come across over the years but have yet to give it a try. Delicata were described as having a corn like flavor – slightly sweet and nutty. In addition, their skins are thin and edible. While shopping at my farmer’s market recently, I found a farmer selling some delicata squash and decided to finally give ‘em a go. As I researched recipes, I decided to go with something that incorporated of some of my favorites – cheese, spinach, and nuts. So, if all else failed, at least there were things that I liked! This can be helpful when trying new foods – pair them with something that is familiar and that you already enjoy. Delicata is easy to work with compared to other winter squash. It is easy to cut into and cooks relatively quickly. You can also save the seeds and roast them like you would pumpkin seeds for a tasty, high fiber snack. When is the last time you took your taste buds on an adventure? 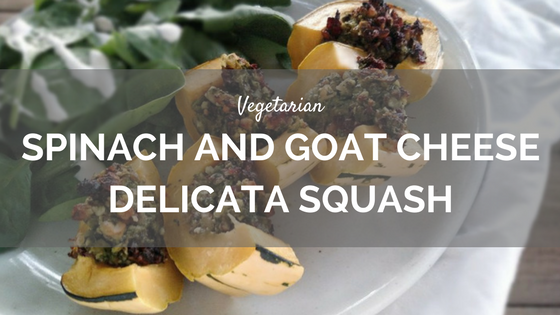 Have you tried delicata squash? Is it available in the markets where you live? Delicata squash is an easy to work with, quick cooking squash that is similar in taste to sweet potato or corn. This hearty dish is perfect as is or served as a filling, high fiber side dish. Preheat oven to 405 degrees Fahrenheit. Wash and cut delicata squash in half, lengthwise. Scoop out seeds using a spoon. Save seeds for roasting later if desired. Brush olive oil on tops of squash where flesh is exposed. 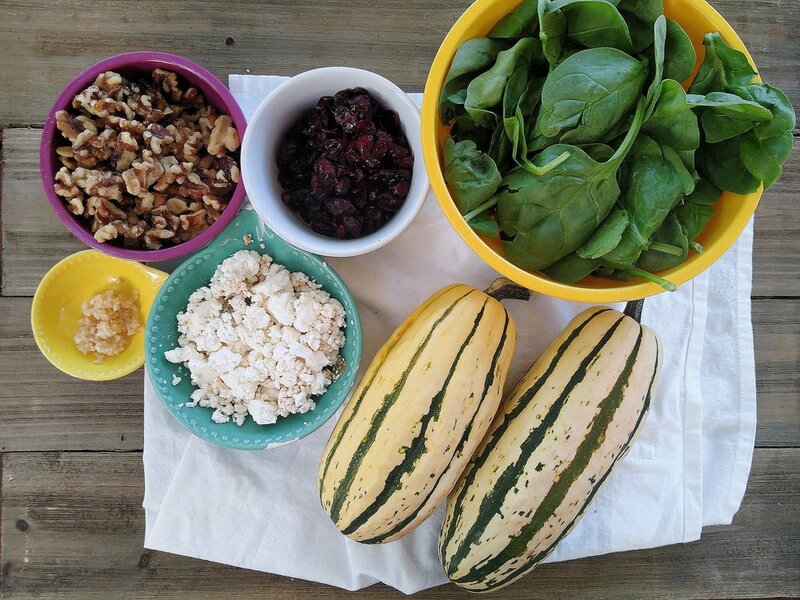 In a food processor, combine spinach, walnuts, cranberries, cheese, garlic, salt and pepper to taste. Pulse several times until well combined, about 3-4 times. 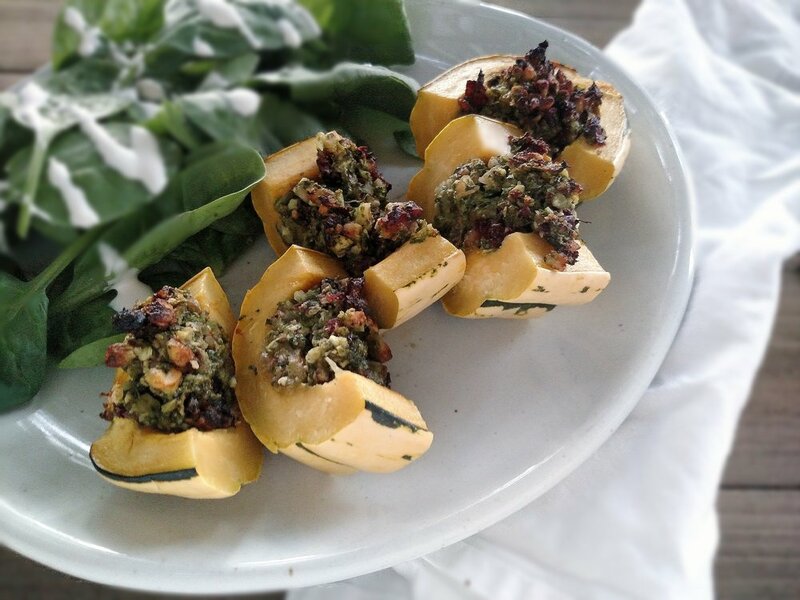 Fill squash halves with spinach mixture (about 1/4 to 1/2 cup per squash). Place squash filling side up on an oven sheet and roast in oven for about 20-25 minutes until squash is easily cut with fork and tops are lightly browned.